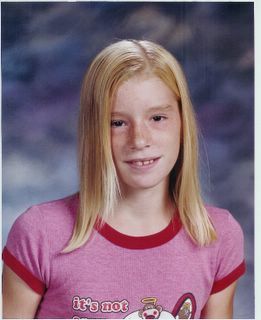 Katie is 12 years old and was diagnosed with Hodgkin's Disease on January 7th, 2005. I come to you requesting prayer. On Sunday we learned that a member of our church is very sick. Her name is Katie Wernecke. and she is a 7th grader at Banquete Jr. High. She began coughing and not feeling well on Thursday she was taken to the doctor and diagnosed with Hodgkin's Lymphoma in the 4th stage, complicated by a microplasma pneumonia. The doctors knew that her lungs were affected and were more than sure her kidneys were, too, but were unable to do the necessary biopsies, bone marrow tests, etc. until the pneumonia was more under control. When Brother Keith, Debbie, and I got to the hospital yesterday, she had been taken for the biopsies, bone marrow, and to have a port put in for the chemo. When you've said your prayer, dial 1-361-333-KATY (5289). You'll hear a series of beeps and you're page is on it's way to Katie! blessing to our church and our youth and we're praying so hard for her. Actually Posted Jan 10th 2005, kept in top position to explain the use of the Prayer Pager.